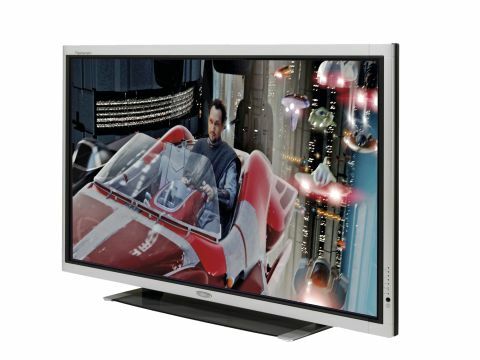 While many big TVs aren't shy about their design choices, Fujitsu's 63in P63XHA51ES has plenty of design subtlety. Fujitsu's argument is if you've already got a 63in screen to accommodate, you don't want it to contrast with your living room décor. So the bezel of the P63XHA51ES wears a delightfully shy and retiring matt silver finish that looks sharp, but blends with almost any décor it's placed with. Aside from its design the P63XHA51ES doesn't make much of an effort to blend in to a home environment. For it doesn't sport a built-in tuner (analogue or digital) or any built-in speakers. You can buy optional speakers for this screen, but they'll set you back the rather scary sum of £500. Before we get too down about all this, though, it's worth saying that there's a good chance anyone spending £8,500 on a 63in screen will probably have a source like a Sky HD box to feed it, and so won't miss the tuner. And they might very well also have a separate audio system, too. However, Fujitsu once again shoots itself in the foot by only providing a single HDMI among the P63XHA51ES's connections - a near criminal act on a screen crying out for high-quality sources. At least it does provide a PC port and a component video jacks. Interesting features of the P63XHA51ES are pretty much restricted to its AVM II image processing engine. This motion-adaptive de-interlacing system delivers enhancements such as reduced jaggedness around contours, reduced MPEG noise, reduced mosquito noise, and smoother, clearer handling of moving objects. As with other Fujitsu screens we've seen recently, the P63XHA51ES isn't particularly comfortable with standard-def, but pretty much rocks with hi-def. The most immediate hi-def impact comes from its sharpness, as the phenomenally detailed shots across Coruscant's city in our Revenge of the Sith hi-def test movie are reproduced with breathtaking accuracy - a feat made all the more impressive by the size of the screen you're witnessing it on. Black levels are also very respectable. While we've seen even deeper, richer representations of dark interiors like those in General Grievous' ship during the opening scenes, it has been rare indeed for us to see dark areas so well populated by subtle shadow detailing and colour shifts. This makes the picture look unusually full of scale and almost addictively immersive. Once you've picked up on the subtle background details, you also notice how deft this screen is with colours during hi-def viewing, with immaculate colour blends and emphatically natural tones. Strangely, though, these tones tend to lose some of this naturalism - especially in the green department - when you switch to standard-def. There's one other more general weakness that affects both high and standard-def alike: vibrancy. When placed alongside Pioneer's PDP-607XD - which also costs £3k less despite being only 3in smaller - there's just no denying that while natural, the Fujitsu's colours are less saturated and dynamic. This mix of highs and lows means we just can't give the P63XHA51ES a whole-hearted recommendation.